For the 183rd anniversary of the Battle of the Alamo, we hosted more than 30 special events from Feb. 23 through March 6. 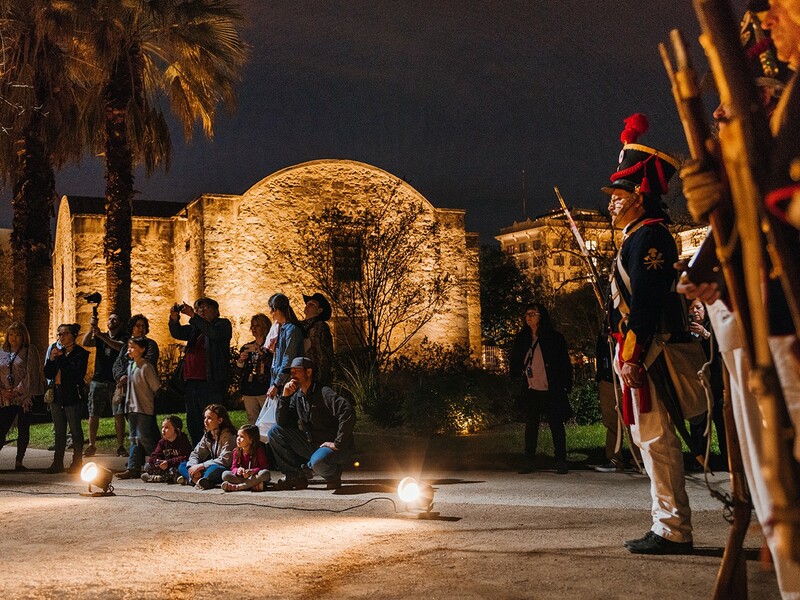 Over 47,000 visitors experienced our commemoration programming, participating in unique tours like The Alamo After Dark, a one-of-a-kind after hours tour of our site with the Alamo’s Conservator and Archaeologist. We partnered with organizations like the San Antonio Living Historian Association (SALHA), the Sons of the Republic of Texas (SRT), the Daughters of the Republic of Texas (DRT), to hold events honoring those legacy organizations and descendants of the Alamo defenders. 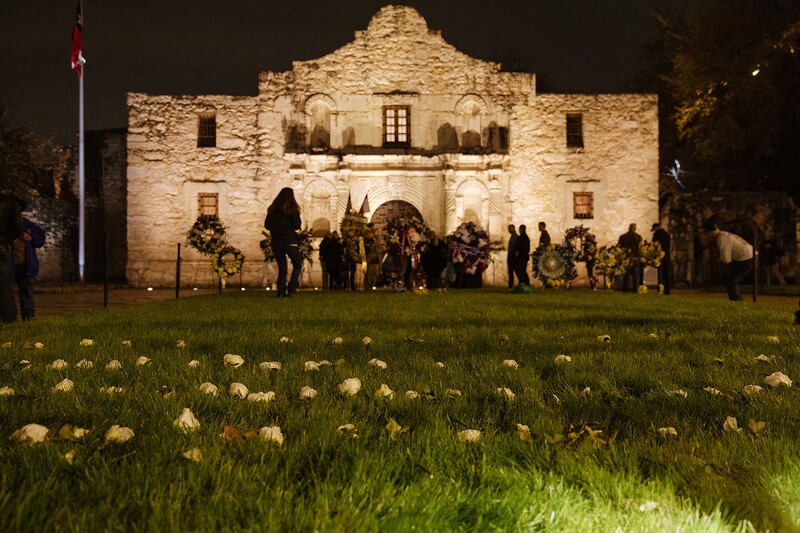 At 6 a.m. on March 6th, the Alamo held Dawn at the Alamo in partnership with SALHA. This somber ceremony featured live reenactments of specific moments during the 13-day siege of the Alamo and the presentation of wreaths by legacy and descendant organizations in front of the church. You can watch a recording of the ceremony at this link. In addition to Dawn at the Alamo, we partnered with the DRT for a memorial service for the heroes of the Alamo, and the SRT for After the Fall of the Alamo. To end the night, we turned the spotlight over to more than a dozen descendants of Alamo defenders in our Remember the Defenders ceremony. “We created more programming for Commemoration this year than any year before,” Alamo CEO Douglass McDonald said. “With daily living history demonstrations in the plaza, several reenactments, and ceremonies with legacy organizations like the DRT, Commemoration remains the absolute best time to visit the Alamo,” McDonald added. 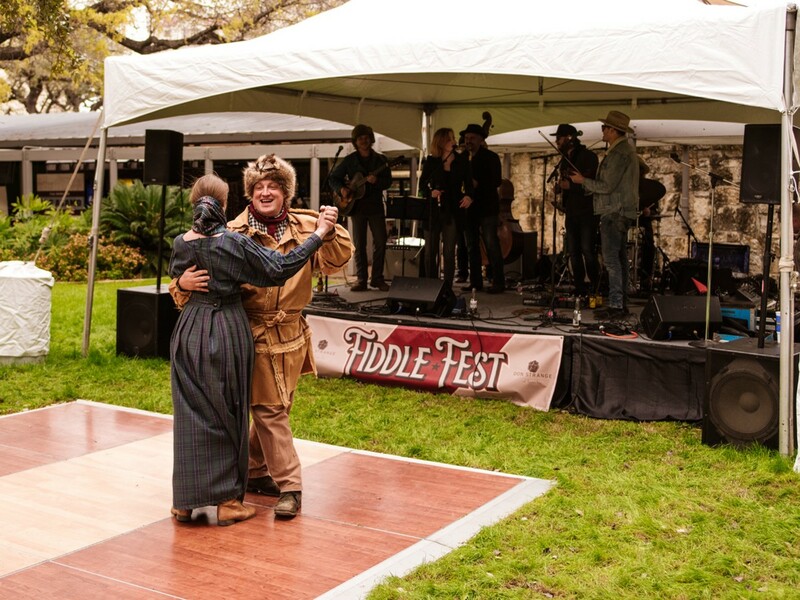 As usual, the majority of our Commemoration events were free and open to the public including La Gran Marcha del Ejercito Mexicano, Never Surrender or Retreat, Historians Speak: Convergence of Cultures in the Texas Revolution, Movie Night at the Alamo, and the sixth annual Crockett Fiddle Fest. 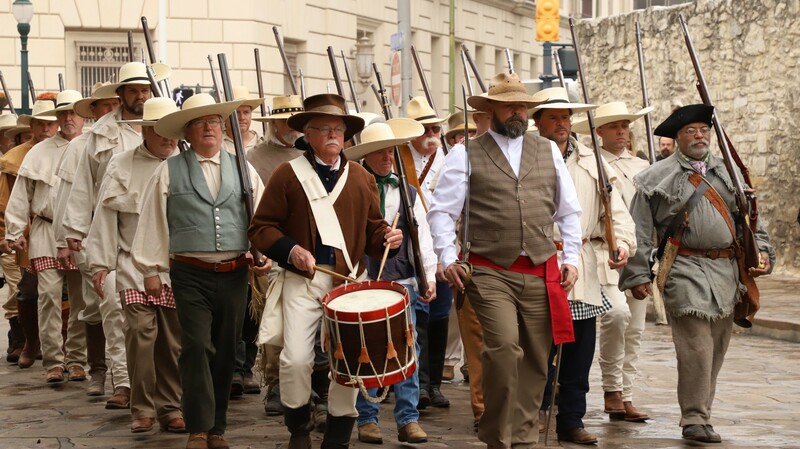 For this year’s The Immortal 32 Arrive ceremony on March 1st, the Alamo enlisted the help of 30+ volunteers from Gonzales to help us recreate the arrival of the 32 men who came from Gonzales to reinforce the Alamo in 1836. Alamo CEO Douglass McDonald presented Gonzales Mayor Connie Kacir with a special gift from the Alamo, thanking the City of Gonzales for everything they did for the defenders of the Alamo. Terry Fitzwater, Editor of The Gonzales Inquirer, participated as a reenactor in this event, was thrilled to take part in this event. “Gonzales, you should have seen it,” Fitzwater professed. “I sincerely believe that the second coming of the Immortal 32 was done with as much reverence and solemnity as humanely possible,” Terry said. 32 men from Gonzales answer the Alamo’s call at The Immortal 32 Arrive on March 1. Our goal with Commemoration every year is not just to honor the defenders who died fighting for Texas’ independence but to educate the public on why the history of the Alamo is important. 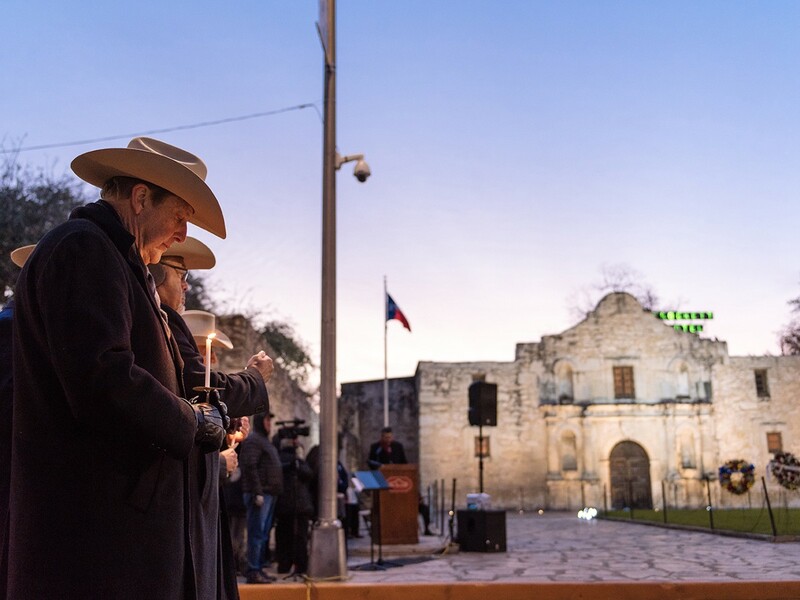 Countless descendants of Alamo defenders attended Commemoration events like The Immortal 32 Arrive, our Texas Independence Day Ceremony with the DRT, Dawn at the Alamo and Remember the Defenders. We thank all the visitors who stopped by the Alamo during Commemoration this year. “Helping the public better understand and appreciate the sacrifice that the defenders made in 1836 makes all of the time and energy spent planning this annual 13-day event worth it,” Douglass McDonald says. Dozens of roses laid in front of the Alamo Church by descendants of the Alamo defenders at the Remember the Defenders ceremony on March 6.